This year, I was happy to be invited back to blog about Halifax for the Downtown Halifax Business Commission. 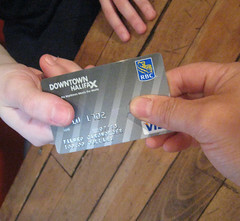 Like last year, I was handed a pre-loaded $100 Visa card with three basic conditions; spend the money in downtown Halifax, blog about the experience and keep it legal (love saying that). There was one other catch - to try something new. 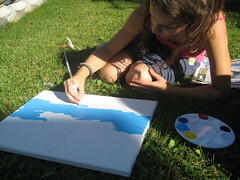 I got to thinking came up with the idea of asking kids to paint Halifax by asking a simple question: "What is Halifax?" Because kids see things differently than adults. With Visa card in hand, I recruited my creative friend to join me at DeSerres to stock up on supplies. After spending $100.40 we walked over to Grand Parade to meet the rest of the kids and parents. On the last official weekend of summer it wasn't long before brushes were flying and creative juices were flowing as pigeons and tour groups looked curiously on. A Canadian flag on a building nearby. A boat in the harbour. 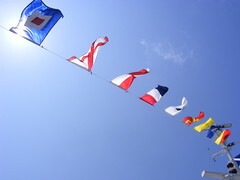 The ship mast in Grand Parade. It was fun to watch their creations take shape. 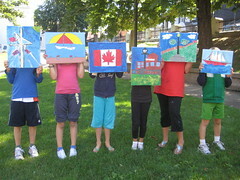 Here were six kids in the heart of downtown Halifax painting their city. 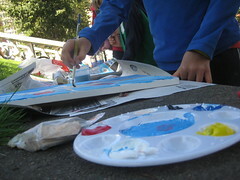 Today they paint it, tomorrow they'll shape it - the future lies with them. Wouldn't it be interesting to invite the same kids back in 20 years to paint Halifax with their answer to the same question again? Thank you Wyatt, Dylan, Lindsay, Emily, Mia, Lauren and Downtown Halifax Business Commission for getting my creative juices flowing again. This summer I was thrilled to be selected, along some 30 other bloggers, to take part in Big Day Downtown, Downtown Halifax Business Commission's clever new campaign. I had $100 to spend any way I wanted in downtown Halifax, "as long as it's legal" joked Executive Director Paul MacKinnon. After some consideration, I picked Argyle Fine Art to slap down my VISA card. I walked in, quickly cased the joint, then walked out. Let's pause for a second. I resisted the urge to delight my taste buds with the $100 bucks, even passed up the Harbour Hopper (never been) and other fun stuff. 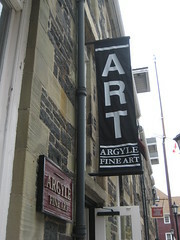 Yup, Argyle Fine Art was my pick. So why did I walk out? It certainly wasn't the friendly assistant (Crystal) who was very helpful and sweet. Even when I was trying to remember the name of an artist from Annapolis Valley (duh, like there is only one!) You see, I felt a bit awkward and decided to come back later. and made a bee line for Argyle Fine Art. As soon as I walked through the door Crystal exclaimed excitedly "Ruth Marsh" Yes! That was the artist! 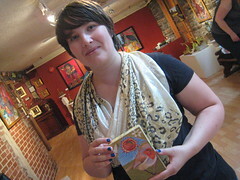 At this time owner Adriana Afford was in the gallery and brought up an email sent earlier from Ruth saying how she was stopping by the store that day to drop off new sketches. That was it. I had to have anything, something of Ruth's in my possession. Just as I was mulling over three encaustic tiles (hot bees wax paintings), in walks Ruth with her partner through the door. How awesome to meet this wonderful talented artist! However, things got complicated because Ruth brought the three sketches she mentioned in her email and now it was a toss up between the sparrow, the owl and the rose. As my purchase was being wrapped up, I asked Adriana about her 8 year experience as gallery owner and how she started on Argyle Street then moved to the present location in Historic Properties. This gallery has a lot of activity year round, anything from live music performances, short films to art exhibitions can be found here. With a variety of contemporary art by established and emerging Canadian artists, the walls and shelves make you think you should pay admission. Some of you may be wondering if I went over the $100. Well, I only paid the $15 sales tax. I learned that this gallery has hidden treasure troves everywhere. With prices ranging from $100 to 6K, tell them what you have in mind and they'll open up a drawer somewhere and pull out fabulous pieces. Crystal explained that they just can't display everything so it's a good idea to give them an idea of what you are looking for and don't think that what they have on display is only what they have. I was pleased as punch with my new purchase and my first experience at Argyle Fine Art, topped off with talking to the artist about the meaning behind my painting. 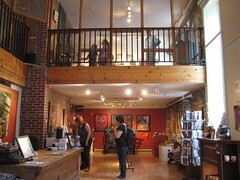 This place provides a warm and friendly environment for everyone to enjoy art, learn about art and acquire art. I will walk in again. Here's a picture of Ruth holding Peach Sparrow. 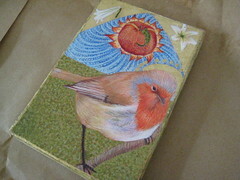 Ruth's work imagines animals in an idealized form and in a sense of despair to motivate us into action to protect them. By portraying them as saints, they are appealing to us for help. "Let me take you down, 'cause I'm going to Strawberry Fields. Nothing is real and nothing to get hung about. Strawberry Fields forever." I was told it was too late in the season for picking strawberries. I never was all that good at listening. So my foodie friend Kristen (of With Bite) and I went to Wolfville for the day anyway. 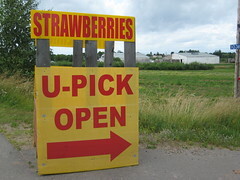 After a visit to the Farmers Market, we stopped at one of three u-picks open that day. Our u-pick pick was Elderkins. We went to the store, grabbed our crate and wooden quart-sized boxes and made for the field across the way. The occasional rain shower was a reprieve from the 30C hot and humid day. Not that it mattered much, those red dots peeking out of the bushes were beckoning. 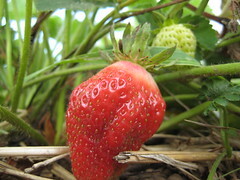 We picked along, turning back leaves to reveal plump red juicy strawberries. 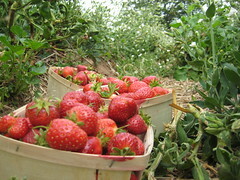 The bigger berries could be found at the bottom due to their weight. Row upon row...roaming from patch to patch, it didn't take long before Kristen and I were at opposite ends of the field. Once in a while we'd shout out to one another, "oh boy, hit the jackpot here!" or "hello over-sized strawberry, of course you can come home with me!" I was a good girl, I only popped three in my mouth (sorry Mr. Elderkin). It was hard to pull away but one hour got us our bounty and the clouds looked like they were going to burst again. There were still lots of unripe strawberries everywhere and Kristen and I figured there was still at least one week left of picking. On a grey Saturday morning, with travel mugs perched in their cup holders, my friend Kristen of "with bite" drove highway 101 from Halifax to Wolfville. Valley girls, for the day. Before passing by Domaine de Grand Pré and the beautiful Victorian homes just outside Wolfville, we made a pit stop at Just Us! Coffee Roasters for a re-fill. This coffee is my fav and there is always a bag in my cupboard. 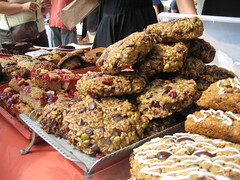 The Wolfville Farmers' Market is pretty easy to find. Just follow the smells, the live music or anybody carrying canvas shopping bags. This is a market where fresh produce doesn't have to travel far. It is, after all, the Annapolis Valley, where those apples were picked in an orchard just down the road. 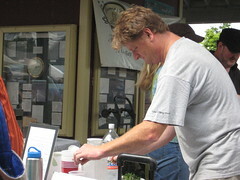 Last week, the Info Booth's featured item of the week was fennel. Fennel was just starting it's first week in season and samples of fresh fennel vichyssoise were available to taste. 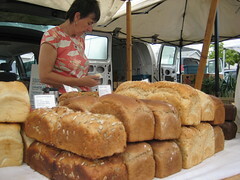 You could pick up a copy of fennel recipes with an ingredient checklist of items available right there at the market. Clever thinking. After chowing down in one of the yummy cookies pictured above, Kristen and I watched Chef Michael Howell prepare a fabulous drink called Raspberry Lime Rickey (lime simple syrup, raspberry puree and soda water). You see, raspberries were also in season and a u-pick had recently opened nearby. I was on a quest to find lavender jelly (August 2008 blog post) since I was down to my last teaspoon but was told the ladies weren't there that week. Kristen started her Christmas shopping at a jewelery booth. Next, it was time for these two valley girls to find a strawberry u-pick. That blog post is coming up next. 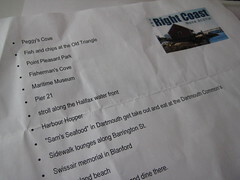 In my last blog post, I asked for your advice on how to plan a 45 hour visit for a friend visiting Halifax for the first time. I asked, you answered. On Facebook, on Twitter, by email and hollering over my cubicle. A page full of your suggestions were printed, folded and tucked in my bag for BC Brian and I to regularly check to make sure nothing was overlooked. A few hours after BC Brian's arrival, it was time to hit the Halifax waterfront. We were dropped off at the Halifax Town Clock where BC Brian asked if it was a re-constructed lighthouse. This self proclaimed "arrogant westerner" was in for a lesson. After a stroll along the waterfront boardwalk, being peppered with questions (that sometimes stumped me), we ended up on the patio at the Old Triangle Irish Alehouse. As the evening went on, we continued down the boardwalk to Garrison Brewery where we sampled Jalapeno ale and award-winning Imperial I.P.A. beer. Here we met cruise ship passengers Kelly and Todd of Los Angeles who were staying an extra day due to bad weather elsewhere. The next morning, after breakfast at Cora's, with the threat of rain showers, BC Brian and I were Peggy's Cove bound. The windy road leading to this classic fishing village just 30 minutes outside Halifax was no stranger to tour buses. Of course, no visit to Peggy's Cove is complete without a visit to the Swiss Air memorial site. By now, the rain had started and we made a bee line to Pier 21, Canada's Immigration Museum. Having the privilege of working there for 4 years, BC Brian was treated to personalized tour through the exhibits and film, "Oceans of Hope". The clock was ticking and our stomachs were rumbling so the next stop was John's Lunch in Dartmouth. So many of you suggested this place for making the best fish and chips in town and for good reason. It was really good. Melt in your mouth fish and buttery clams good. All topped off with being treated like family in this 1969 style diner. The friendly service gave no need for dessert, they were sweet enough. After stuffing ourselves and taking a few snaps of Halifax from the Dartmouth side, we headed back over the Macdonald Bridge. While seafood was on the brain, I quickly realized that one simply CANNOT come to Nova Scotia and not have lobster and a good feed of mussels. Plus, they were on "the list". 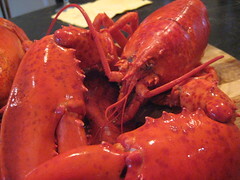 I have to admit, it was my very first time cooking live lobster without parental supervision. Hoping BC Brian would not notice, I did the best thing I could think of... offer him a Keith's. You see, that was on the list too. What wasn't on the list was convincing BC Brian to stay another day. You see, all of you suggested such great things and 45 hours simply wasn't enough time to enjoy them all. Thankfully, BC Brian agreed and changed his flight. This bonus day was BC Brian's self-exploration day and he made good of it. Visiting the Maritime Museum of the Atlantic, Rum Runners Rum Cake Factory, Brewery Market and having lunch at the Lower Deck "across from the big cow". That evening at the Triangle, BC Brian just couldn't stop smiling. My highlight of the evening was when BC Brian turned to me and said, "this is just like the Nova Scotia tourism commercials!" I wish I could tell you at this point that everything on "the list" was crossed off. In fact, we got about half way through. I figure that you have to leave some things to explore next time. BC Brian tells me that he's hoping that there will be a next time, with his wife in tow. I don't think he'll have too much trouble convincing her, after all, he's our newest tourism ambassador. So my friends, THANK YOU for your suggestions. 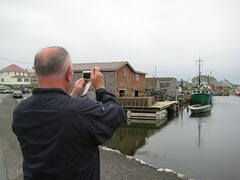 Also thanks to Tourism Nova Scotia who shouted out to their followers and likers on Twitter and Facebook. 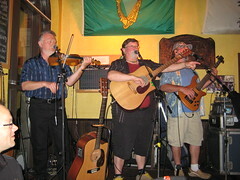 Most of all, thank you BC Brian for visiting Nova Scotia. See more pictures from BC Brian's visit on Flickr. A few weeks ago I got a phone call from my friend "BC Brian" announcing that he's visiting me in Halifax. Hailing from northwestern British Columbia, this is his first trip to the east coast. After looking at the calendar, I realized that I have 45 hours to give BC Brian a favourable impression of Halifax. This is where I'm asking for your advice, your thoughts... your do's and don't's. Here are the deets: BC Brian arrives next Wednesday at 1 p.m. and leaves Friday at 10 a.m. (for Montreal). He's staying at our house during his brisk 45 hour visit. Let's factor in the 4 hour time difference. So what would you do if you were playing tour guide? BTW, I did ask BC Brian what he'd like to do and I haven't heard from him yet so I am taking it upon myself to ask you. Just like the Canadian Tourism Commission's "Locals know" campaign. I'll let you know how the 44 hours came and went. If you were on a boat near Cape George, Nova Scotia in the mid 1800's, you couldn't help but notice the lighthouse. And, if you did, you'd be in a bit of trouble! 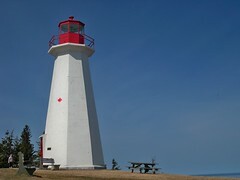 In 1861, the first of three lighthouses were built to guide fishing boats around Cape George Point. This first lighthouse was powered with a ten foot diameter iron lantern, with eight sides and cut glass prisms that demanded 120 gallons of oil each year. Glass prisms from the second lighthouse where unique and rare in cut and are on display at the Bluefin Tuna Interpretation Centre, a few minutes down the road at Ballantyne's Cove wharf. Over 107 years there were four lightkeepers. From the Condon family (1861) to Alex MacEachern (whose annual salary was $450), Charles Falkenham and finally William Clark (1968), they kept the lighthouse lit 24/7. Today, the lighthouse is automated and unmanned. The grounds are kept well by volunteers and there are a lot of picnic tables to eat your lunch, enjoy the view and snap pictures of St. George's Bay, PEI and Cape Breton. Interpretive panels are on site to learn more about the history of the area. To get there, take route 337 which follows the shoreline through small fishing communities overlooking the Northumberland Strait. It's a beautiful drive. 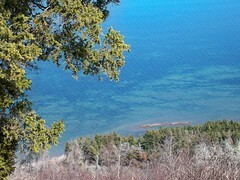 The Cape George Hiking Trail offers 33 kilometers of connected loops and linear sections. Cape to Cape Trail Nova Scotia’s first long distance footpath traveling over 400 kilometers, all the way from Cape Chignecto in Cumberland County to Cape George in Antigonish County. It's under construction. The Right Coast Nova Scotia. This blog is about everyday living on Canada's east coast. It's an informal look at family, travel, food, people and culture while living on the right hand side of Canada. My family and I lived in British Columbia for 11 years and moved "home" 10 years ago - so we've lived on both of Canada's "left" and "right" coasts.